Like many people, I grew up in a town with a Wonder Bread factory. I used to love when we drove through the neighborhood near the factory, because the air was thick with the comforting smell of baking bread. If you’ve never experienced this, go hang out at Gilgal Gardens behind the Salt Lake Wonder Bread bakery and you’ll instantly know what I’m talking about. I had a de ja vu moment this morning when I pulled into the Dan’s supermarket parking lot in Olympus. Not from anything coming out of the Dan’s bakery (although I’m sure they had some delicious items in there as well) but rather smells emanating from a tiny silver 1955 Shasta trailer at the far end of the lot. 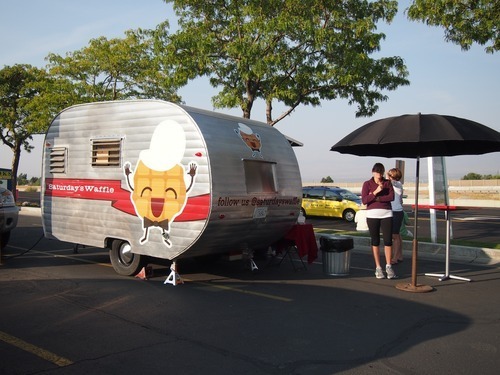 It seems like waffles are invading Salt Lake. 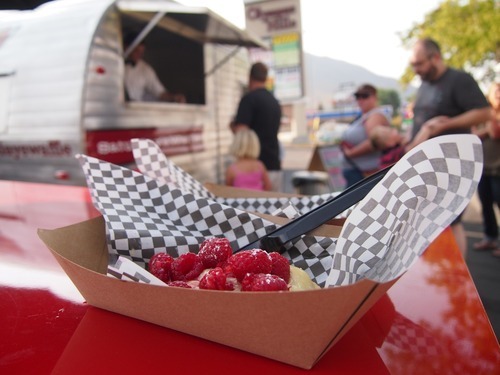 Bruges is opening a new location in Sugarhouse in addition to their crazy-busy location near Pioneer Park, and there’s a new waffle truck called Off The Grid that has hit the streets as well. 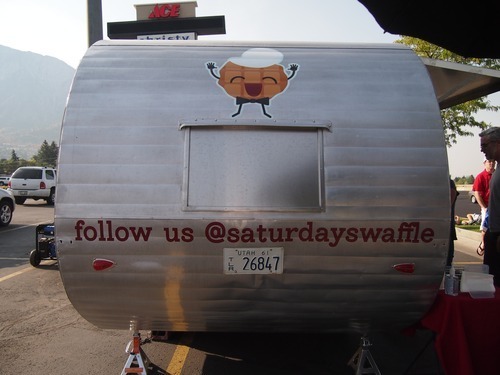 The Saturday’s Waffle trailer specializes in making Liege-style waffles. If you haven’t had the type of waffles before, they are incredible. A leavened dough produces waffles that are crispy and denser than the traditional “American” waffles you’re used to. Also, pearl sugar is mixed in the dough, which gives the final product an interesting, crunchy texture, and makes an otherwise ordinary waffle extraordinary. 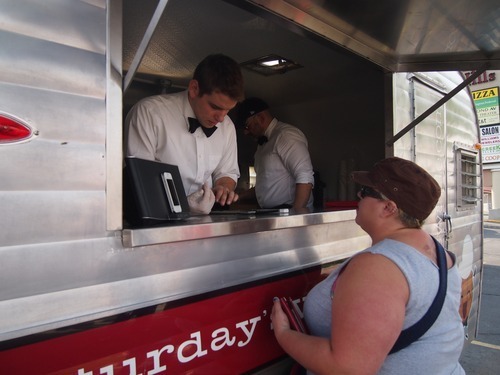 When you approach the trailer, you’ll be greeted by sharp-dressed men wearing bow ties. They offer a number of specialty waffles. For $7, you get their deluxe, or signature waffles. 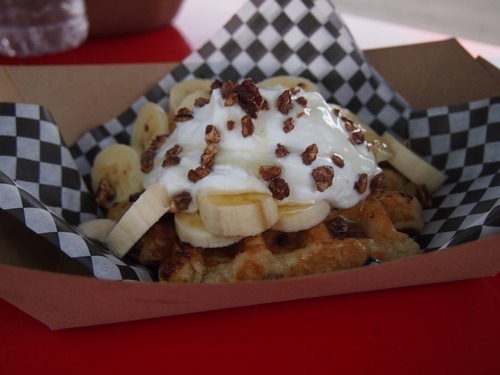 Jeffrey tried the Mt Olympus: a waffle topped with bananas, candied pecans, honey, and Greek yogurt. Tony tried the lemon curd and fresh raspberry. Jo had the Apple Pie: topped with apples and cheddar cheese. But I knew I had a date with destiny: the Benny. 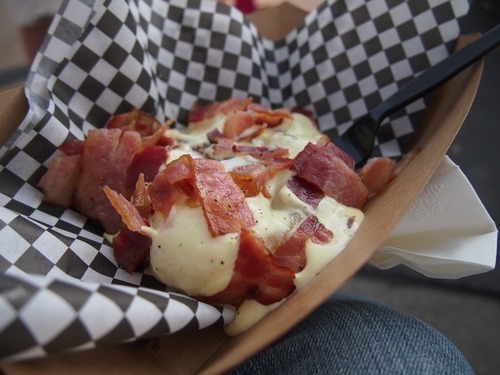 A waffle topped with the unholy, yet delicious, combination of hollandaise sauce, soft-boiled egg, bacon, and pepper. The Bennie. There’s a waffle under there, somewhere. It was good. I would have preferred my eggs cooked a bit more (some of the whites weren’t cooked, and although I like runny yolks, runny whites give me the creeps [says the guy who eats raw cookie dough by the pound]). But the combination of the sweet waffle, savory eggs and bacon, and the tangy hollandaise all worked well together. The next time I stop by, I think I’m going to stick with the $5 selection. For $5 you get a waffle that you can top with two ingredients of your choice. Toppings are: peaches, strawberries, raspberries, bananas, peanut butter sauce, Nutella, speculoos (Biscoff spread), Greek yogurt, candied pecans, and whipped cream. The portion size isn’t huge at Saturday’s Waffle, and I think I’d get more bang for my buck with the $5 selection. 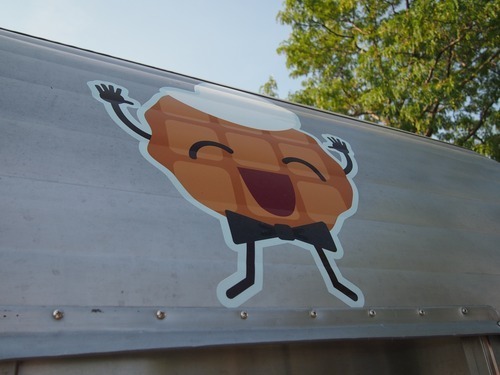 I think a waffle topped with candied pecans and peanut butter sauce is in my crosshairs the next time I stop by. 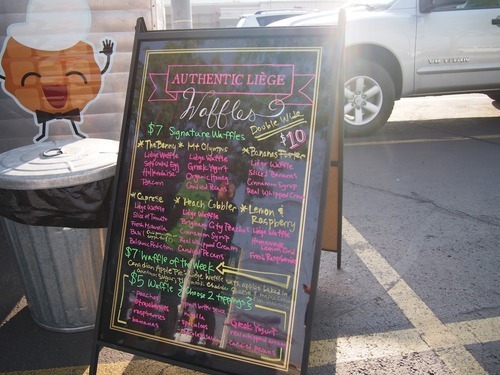 Oh, and you can get a double waffle, or a “double-wide” for $10. Be sure to give Saturday’s Waffle a try, and let me know what you think. 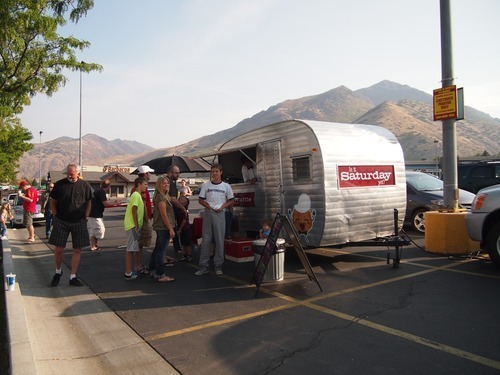 They’re located in the Dan’s parking lot on Saturdays and they also do special events. Your best bet to be updated on their current location will be to follow them on Twitter or like them on Facebook.